Govt of Telangana has decided to appoint 11428 Vidya Volunteers in existing vacancies as per new strength as on 30.06.2018. and as per new rationalization guidelines. Interested Candidates to work as Vidya Volunteers may have to Apply Online at ssa.tg.nic.in Vidya Volunteers/VVs/Academic Instructors Recruitment in Telangana Apply Online at ssa.tg.nic.in from onwards. 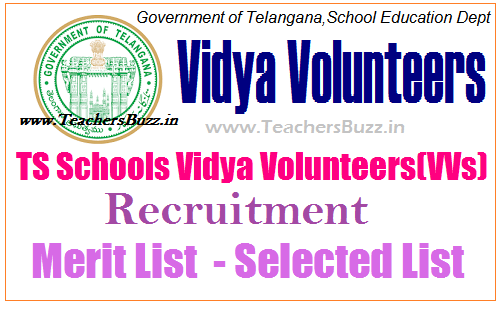 Candidates should apply online for the Recruitment of Vidya Volunteers in Telangana at the Official website of SSA www.tg.nic.in , TS Schools 11428 Vidya Volunteers Recruitment Notification 2018 in Telangana, VVs recruitment Online application form ssa.tg.nic.in, Last date for apply online, selection procedure, VVs recruitment guidelines, how to apply and selection list/merit list preparation procedure. Application forms for VVs will be available at TSSA web portal ssa.tg.nic.in . Proceedings of the Director of School Education Telangana: Rc.No.44/PS2-2/2018 Dated: 27.05.2018 Sub:- School Education - Engaging of Vidya Volunteers through School management Committees (SMCs) with a Honorarium of Rs.12,000/- per month for the Academic Year 2018-18 - Orders communicated - Reg. References: 1.G.0.Rt.No.86, School Education (Prag.I) Dept, dated:25.05.2018. 2. G.O.No.97, School Education (Proq.I) Department, dated :29.06.2016 along with guidelines. Copy of Government Orders 1st read above, Govt of Telangana hereby accorded permission to engage the services of 11428 (Eleven Thousand Four Hundred Twenty Eight) Vidya Volunteers in the existing vacancies and retirement and leave vacancies from the month of June for the academic year 2018-18 as indicated in the reference 1st cited. The honorarium to the Vidya Volunteers for Rs.12000/- (Rupees Twelve Thousand only) per month per head. Further, all the District Collectors and the District Educational Officers in the State to engage the Vidya Volunteers (as per annexure) in the schools for the academic year 2018-18. 1. The Vidya Volunteers shall be engaged from 12th June, 2018 to till last working day as approved by the District Collector concerned. They are purely temporary and can be terminated at any time based on justifiable grounds by the School Management Committee (SMC). 3. Candidates should have completed 18 years of age and upper age limit is 44 years as 1st July, 2018 (5) years relaxation is given in case of SC/ ST/ BCs and (10) years for Physical Challenged persons. 4. Unit of roster is the District. As per the sanctioned number of Vidya Volunteers for the year 2018-18, the District Educational Officer (DEO) shall allot roster points first to the Manda! by arranging the Mandals in English alphabetical order. Later, in the Manda! he will arrange habitations in English alphabetical Order to follow the Govt guidelines issued in G.O.Rt.No.97, School Edu(Prog.I) Dept, dated:29.06.2016. 5. The District Collector shall draw a detailed Schedule for completing the selection of Vidya Volunteers and communicate the list of Vidya Volunteers to MEOs by 7th June, 2018 and the MEOs shall complete the verification process and furnish the list to SMCs by 9th June 2018, so as to engage the services of Vidya Volunteers by SMCs from 12th June 2018 for the Academic Year 2018-18. It continuation of this office proceedings all the District Educational Officers in the State are informed that instructions were issued to engage Vidya Volunteers through SMCs during 2018-18. As per the guidelines communicated therein the candidate shall apply online and submit a signed print out of the application he / she uploaded along with the certificates required to the Mandal Educational Officers. Instructions were also issued to the District Educational Officers to draw a detailed schedule in consultation with the District Collector for completing the selection of Vidya Volunteers and to communicate the list to the MEOs by 7th June 2018, who (MEOs) shall complete the verification process and furnish the list to the SMCs by 9th June, 2018 so as to engage the services of Vidya Volunteers by the SMC from 12th June, 2018 onwards. In this regard, they are inforrned that the Vidya Volunteers application format is created in the Commissioner 8, Director of School Education web site "cdse.telangana.gov.in". They are therefore, requested to give wide publicity in the local Media to seek the applications from the eligible candidates through online on or before 05.06.2018 and complete the process before reopening of re Schools and submit compliance report. TS Schools VVs Recruitment 2018 Schedule. Therefore, they are requested to strictly adhere the guidelines and complete the process of engaging Vidya Volunteers as per the schedule. Any deviation in this regard will be viewed seriously. TS DSE will recruit the Vidya Volunteers (VVs) in the place of vacant teacher posts for the academic year 2018-18. The Vidya volunteers will give their services until regular teachers will be appointed in TS Schools .